Color blindness or Color Vision Deficiency, is a condition that affects many more men than women. 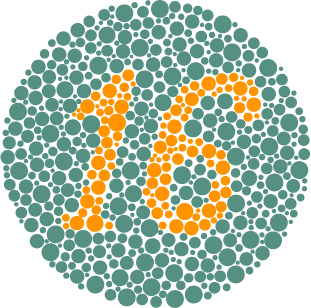 An estimated 1 in 12 men (8%) and 1 in 200 women (0.5%) are color blind. Contrary to its name, 99% of all colorblind people are not really color blind but color deficient. It's a big misconception that color blind people see the world in black and white or greyscale. If you are affected by color blindness, you would see less colors than someone without the condition, but not none. The severity of color blindness is divided into four categories - slight, moderate, strong and absolute. Some countries mandate that you have normal color vision before you can get a driver's license. There are also certain occupations that require normal color vision like electrical engineer, firefighter and airplane pilot. The Eye Test is a free online game by igame that tests your ability to discern between shades of colors. Over a series of grids, you will have to click on the box that has an irregular color compared to the rest of the boxes. You have 15 seconds to decide on each grid but be careful - you lose 3 seconds for every wrong click! Your score at the end of the game is based on the number of rounds that you were able to clear. Trust us when we say it's not easy getting to "hawk" territory. We only managed to get to 23 correct before we ran into a grid that we couldn't solve. If you get a poor score, don't panic just yet. Take the test again to see if the bad result wasn't a one-off. A criticism we had of this test is that the quality of your monitor will have a big impact on your test scores. Maybe the problem isn't your color vision at all but your crappy monitor instead. If you're pretty sure that your vision is just fine, maybe it's time to buy a new monitor. After all, why put up with a terrible screen when you can get one from Amazon for 100 bucks? The Ishihara Color Blindness test was developed by Dr. Shinobu Ishihara, who first published them in 1917, soon after the start of World War 1. It's ease of use and accuracy has made it a commonly administered test worldwide for red - green color deficiencies. In addition to the original paper form, you can now take the Ishihara test online as well. The test consists of either a series of 38 plates or a shorter format consisting of 24 plates although a deficiency will be fairly obvious after just a few plates. These plates are known as Ishihara plates - with each plate being a circle made up of a randomized group of circles or dots. Within the plates are dots that form either a number or shape that is clearly visible to those with normal color vision, and invisible(or hard to see) for those who are colorblind, or the other way around. The Ishihara test we linked to was short but pretty difficult, with 3 seconds given to look at a plate, before having to list down the number in the middle. If you have difficulty spotting the numbers in any of the plates, you might want to get your vision tested. It was surprising to find out that there are more female carriers of the color blindness gene although they are lee affected by it as the deficiency is coded on the X chromosome (and women have 2). There is currently no known cure for color blindness. Take the tests and let us know what you think and how you did. Again, to be completely certain that you're color blind would require a whole battery of tests and these are only a quick, rough indication. We hope you had fun checking out how good your color vision is and for more interesting sites to visit, click the Cool Sites label below.